The best indicators of powerboat cruising performance are: (1) fuel efficiency expressed in nautical miles per gallon (NMPG), just like automobiles and (2) speed attained per horsepower installed. With these criteria, MJM Yachts is #1. 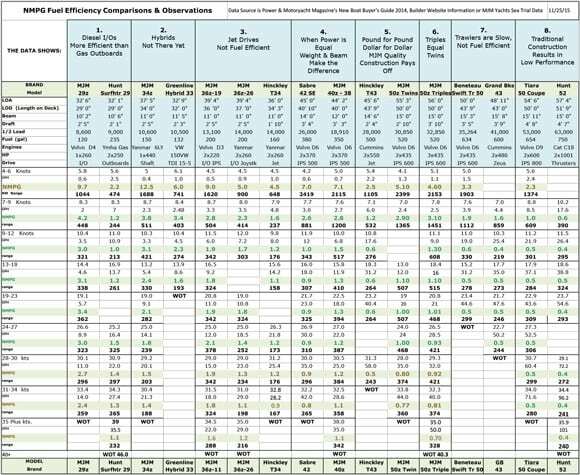 The attached data sheet, NMPG Fuel Efficiency Comparisons & Observations quantifies how its five models outperform other brands and types of powerboats . . . debunking some long held industry shibboleths in the process. MJM 29z power with single 260 HP diesel I/O. 1. Diesel I/Os are twice as efficient as gas outboards. 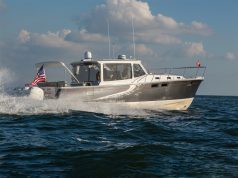 A cruise-equipped MJM 29z with single 260 HP diesel I/O weighs the same as a Hunt Surfhunter 29 with twin 250 HP outboards. Harbor cruising at 8.3 knots, the 29z is 3.5x more fuel efficient . . . burning 2 gph vs. the Hunt’s 7 gph. Cruising at 25-26 knots, the MJM is 2x as efficient, getting 3.0 nmpg vs. the Hunt’s 1.5 nmpg. 2. “Hypebrids” is more apt as a description. A diesel/electric hybrid is not yet the answer. The Greenline 33 Hybrid weighs the same as an MJM 34z. At a displacement speed of 8 knots, where you’d think a hybrid would excel, the MJM is more efficient. Top cruising speed (using 87.5% of wide open throttle) for the Hybrid is 12.2 knots, the MJM is 26.6 knots. 3. Jet drives are not efficient. The MJM 36z (twin 220 HP Volvo Penta D3s) weighs the same as a Hinckley Talaria 34 (twin 260 HP Yanmar 6LY3s) with jet drives. 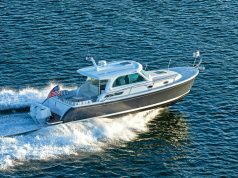 The MJM 36z gets twice the mileage of the Hinckley and is 2 knots faster. You will also note a difference in engine/drive packages. The lighter Volvo D3s on the 36z are more fuel efficient than the heavier optional Yanmar 6LY3s. 4. Weight and beam are major performance factors. A Sabre 42 and MJM 40z have a similar length on deck and the same IPS 500 propulsion package. The Sabre is nearly 50% heavier and 2 feet wider. The epoxy composite MJM has (a) the stability from a lower center of gravity to earn ISO Category A Ocean Certification, (b) 50% better fuel efficiency, (c) an upper end cruising speed of 34 knots which is 5.9 knots faster, and (d) greater range. The MJM 36z underway powered with twin 220 HP stern drive Volvo Penta D3s. 5. Pound for pound and dollar for dollar you get more out of an MJM. 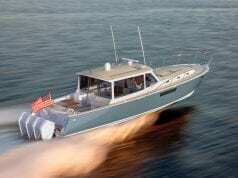 The Hinckley Talaria 43 (2×550 HP Cummins powered jet drives) and the 6 foot longer MJM 50z (Volvo Penta 2×435 IPS 600 pod drives) are the same cost per pound, $56. But, the differences are astounding. Apart from 15% more living space, the MJM 50z with 230 less HP has a 2 knot advantage in upper end cruising speed. At the same 25 knot cruise speed, the MJM burns half the fuel with a 200 mile greater range. 6. Triples are just as fuel efficient as twins. The MJM 50z with triple IPS 600s has marginally better fuel efficiency than that same MJM 50z hull powered with twin IPS 600’s. It’s all about the amount of HP applied to overcome resistance at a certain speed… even at displacement speeds. Seems 3 sets of props do a better job of separating the hull from the grip of the water than 1 or 2 sets of props, even with the heavier engine weight. 7. Trawlers are slow, not fuel efficient. Pushing bluff, heavy hulls through the water at anything beyond 10 knots puts fuel efficiency ratings below outboards and jets. The Beneteau 44’ Swift Trawler 50 (anything but “swift”) at its top cruising speed of 20 knots goes a half nautical mile per gallon (40 gph) while the triple IPS 50z at 35 knot cruise goes 3/4’s of a mile per gallon (48.5 gph). The Grand Banks 43 with 2×480 HP Cummins burns more fuel at 10.3 knots (25.4 gph) than a 50z at 24 knots (24.0 gph). 8. Traditional construction results in low performance. This is evident in the Tiara 50 Coupe and the Asian built Hunt 52. Compared to the high-tech and admittedly more expensive advanced epoxy build of the MJM 50z, the Tiara and Hunt burn nearly twice the fuel at comparable speeds and have a 5 knot slower top end cruise speed with reduced range. The MJM Yachts 50z, the flagship of the fleet. Built in Charlestown, MA on Boston Harbor under license by Boston BoatWorks, each MJM is constructed out of Corecell, Kevlar, Eglass, and epoxy through a proprietary wet pre-preg, vacuum-molding and oven post-cure method developed by Mark Lindsay over 35 years building America’s Cup, World Championship and Olympic medal-winning racing sailboats. Sailboats put a high premium on advanced composite construction to deal with extreme loads on while extracting every knot of speed from a finite energy source – the wind. 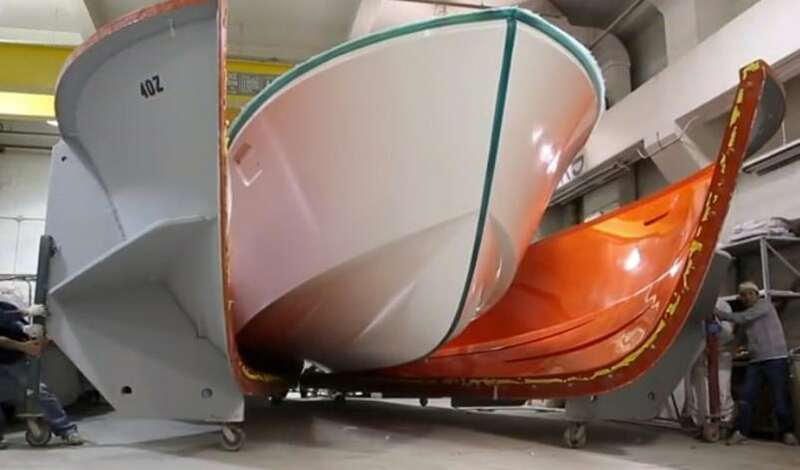 This process fits perfectly with the MJM Yachts GREEN Mission as use of epoxy instead of vinylester and polyester resins virtually eliminates release of VOC’s (Volatile Organic Compounds) into the environment. Then, by burning half the fuel of other boats, owners are contributing to a greener planet as their carbon footprint . . . the amount of hydrocarbons, particulates, nitrogen oxides, and many other contaminants released into the environment . . . is halved. An epoxy built, fuel-efficient performer contributes to a more satisfying, environmentally sensitive, life on the water . . . not to mention less time and money at the fuel dock. And, like a good stock, it’s not the initial investment, as much as the on-going operating costs, and how it holds its value over time. I was concerned about installing triple IPS 600s in the 50z because it seemed logical that 3 engines would use 50% more fuel than 2 engines. MJM’s mantra from the outset had been “Twice the Fun, Half the Fuel”. Wouldn’t I be pulling the rug out from under a key reason for MJM success? Our designer, Doug Zurn, and the engineers from Volvo Penta straightened me out, “Bob, fuel efficiency is a function of horsepower applied to overcome the drag of pushing a particular boat through the water at a given speed. So, it doesn’t matter whether it’s 1, 2, or 3 engines, the same amount of HP is required to get that hull going. So, 3 engines will each be working less than 2 engines.” But, I wasn’t buying that theory at displacement speeds under 9 knots, where the major part of boat hours are spent in harbors, watching races, on the ICW, etc. Seemed 3 engines would be just humming there, not very productively, when 2 would more than do the job. They had no answer for that. 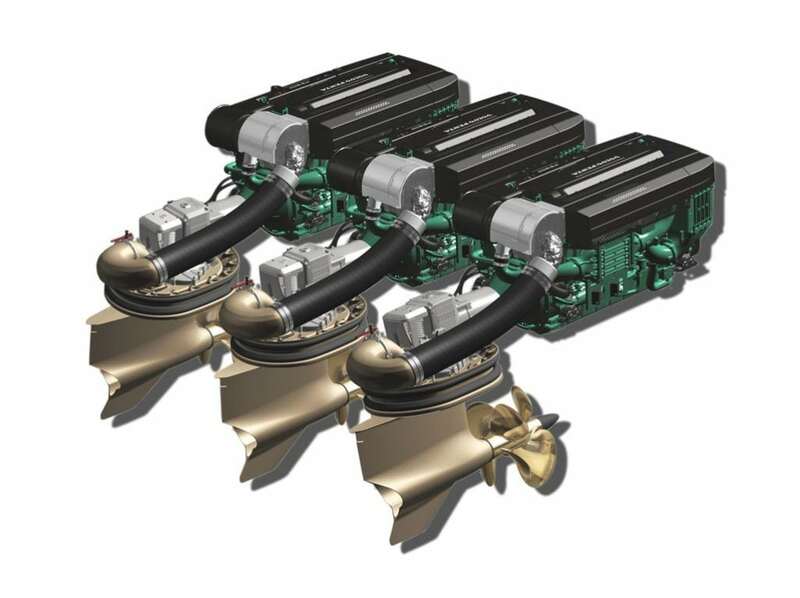 MJM Yachts proves that three engines are better than two engines. 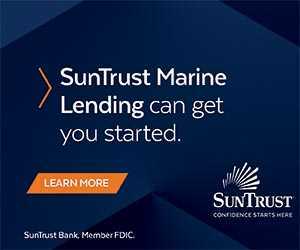 Whether is it was blasting around the harbor in a Sunfish sailboat or a low freeboard Boston Whaler as a kid, those amazing moments launched most of us into the world of boating as a lifetime pursuit. Trouble is, as the boats got bigger, the thrill of driving the early sports car like craft was being lost . . . along with that feeling of being one with wind, boat and wave. 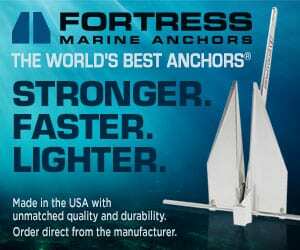 That was the motivation in creating J Boats, Inc., which is the leading performance brand of sailboats and where we’re going with MJM Yachts. So it didn’t take much encouragement from the more youthful of our MJM dealers to brighten the vision of having a 50z that outperformed the Sabre 48, Hinckley Talaria 48 and East Bay 50 by 10 knots, with the same 50 gph fuel burn at 35 knots others got at 25 knots, while keeping a lower profile, flush decks and side doors at floating dock height. We were off and running. Of the 11 MJM 50z’s ordered to date, 9 have been triples. Only 2 have ordered twins. One for shoal cruising on the Chesapeake and Bahamas and the other due to a ledge in front of his dock in Marblehead harbor. The 50z with twins draws only 2 feet 10 inches which is less than a 40z, because the drives are mounted further up and outboard under the hull on the deadrise. If you would like to download the PDF of the above chart, click on the chart, you will be able to save the PDF to your desktop, or print. You must have Adobe Reader installed on your computer. To request further information, click here.